This is a deal that’s hard to beat. Mike raced back from Philadelphia so we could play on Friday, and tonight we went out to dinner at Flemings in Walnut Creek. Flemings is sort of hidden away on the second floor of the parking structure next to the Century 16. They have a mostly hidden door on the ground level, next to World Market at the corner of California and Mount Diablo. It’s worth you time to find the place, though. We drove in, and dropped the car with the valet ($7.00). I made our reservation on opentable.com, as always. Although we were two or three minutes early, Mike and Linda were already there and enjoying their wine. More than 20 years, and I’ve never gotten anywhere first. The facility is very much old-time steakhouse–very dark, thick carpets, dark woods, heavy silver and china. I went to places just like this with my parents when Eisenhower was president. It makes me want to order a perfect Manhattan, just like dad did. I settled for iced tea, like dad should have. The Sunday night special is salad, prime rib, one side dish and dessert all for $30. (we aren’t fooled by the $29.95 now, are we?) That’s what we were there for, and that’s what we all had. The salad is just a salad, nothing to write about. That’s one beautiful hunk of beef, with three choices of dip: au jus, horseradish and a mustard sauce. My meat was perfectly done; a tender, aged slice of meaty perfection. I don’t eat a lot of beef, so if I’m going to indulge it should be with something this good. Each meal comes with a choice of side dish, and each side is more than big enough to share. We had the creamed corn, creamed spinach, asparagus and the potatoes au gratin. They were all excellent. 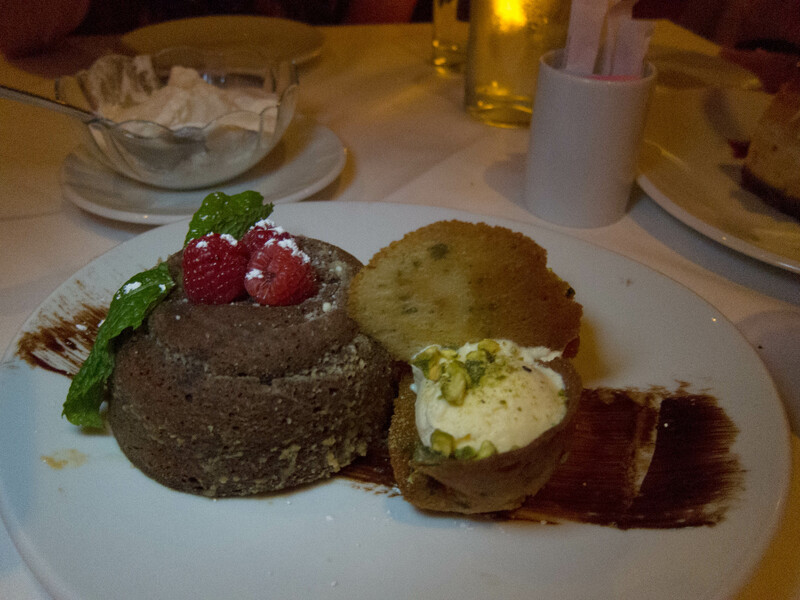 There are the usual choices of hyper-caloric desserts, capped by the lava cake (which counts as two desserts). Linda and I, serious chocolate lovers. chose that. Gail had some ice cream and berries and Mike had the cheesecake. Nobody was disappointed. Scrumptious lava cake, a fueille of ice cream and, behind, a bowl full of whipped cream just in case there weren’t enough calories. This is a hard deal to beat. After Labor Day, I think the price goes up to $39.95 and that will STILL be a good deal. Flemings isn’t good if you’re on a serious heart healthy diet, but it’s a great place to fall off the wagon. 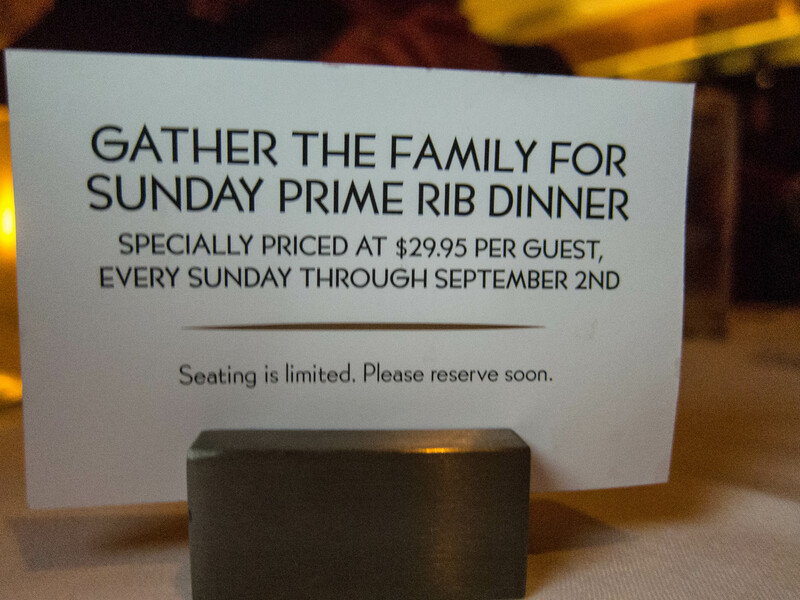 Sounds good, but NO PLACE can beat the House of Prime Rib in San Francisco. Dinner starts with their special salad, prepared tableside. I’m not a big salad fan, but it’s so good that I clean my plate every single time. 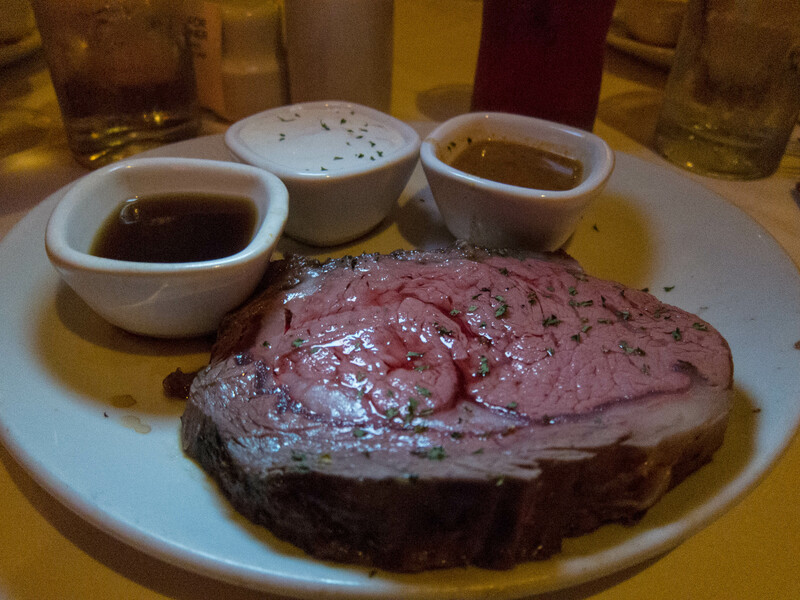 As for the prime rib, it’s cut from the roast at your table. You decide the size of the cut and how much (or little) you want it cooked. Besides the usual accompaniments, mashed or baked potato, creamed spinach or corn, it’s served with perfectly prepared Yorkshire Pudding — something you rarely find elsewhere. Check it out when you’re in the city again, or definitely during the Fall Nationals. Very solid all around. We had a very nice meal here, the highlight of which was definitely the steaks. I had a new york strip medium rare, which was perfectly cooked, and also very well seasoned. You don’t need much more than that, but that’s what you need. The chipotle cheddar mac and cheese was also spectacular – smoky with a bit of heat and nicely coated in thick creamy cheesy deliciousness.Not quite as stellar: the creamed spinach was a little too creamy, being basically more cream than spinach. Also, the seafood tower; it had some pretty excellent items like the jumbo shrimp and the king crab leg, but it was extremely light on the lobster and the lump crab salad was bland and subpar.A couple other notes: They have some really tasty homemade butter spreads they serve with the breadbasket. The place looks great inside, and the service was excellent with the only hiccup being a long wait for our first cocktail. My only other complaint would be the wine list; there are plenty of bottles in the $30-40 range but most of them are from the cheap aisle at your grocery store. You’re gonna have to shell out $50 to find something that really stands up to your red meat.